Who else wants their WordPress blog to rank higher in search engines? A silly question, I know. Everyone does. 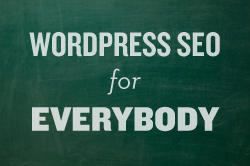 And that’s why we created this ongoing tutorial series called WordPress SEO for Everybody. In it, you’ll learn how to use ethical, legitimate ways to get your WordPress blog ranking higher in the search engines.